It is known by different names around the world, among them: uvilla, guchuva, vejigón, topetorope, aguaymanto, alquequenje, topo-topo, capulí, poga poga, wild tomato, tomatillo, ‘cape gooseberry’ (in English), judaskirsche en Germany and coqueret du perou, in France. The cape gooseberry belongs to the Solanaceae family, so it has similar characteristics to the family of potatoes, tomatoes and tobacco. Its internal structure is similar to a miniature tomato. The cape gooseberry is a semi-acid, round, yellow, sweet and small fruit (measures between 1.25 and 2 cm in diameter), and comes wrapped in a protective shell. The cape gooseberry is considered an exotic fruit, it is used to prepare ice cream, yogurt, icings and chutneys. Its high content of pectin, make it ideal for jams and sauces. Uchuva can be consumed alone, in desserts, in juice, wine, syrup and other sweet fruits. Uchuva is also an attractive ingredient for vegetable and fruit salads, as well as for gourmet dishes, cocktails and liquors. It serves as a decorative element to decorate cakes and pies, as well as cherries or cherries. Processed it can be found frozen, pureed, pulped, jammed, preserved or dehydrated. Nutritional properties of the cape gooseberry It’s interesting that although blueberries are considered a superfood (and indeed they are), Cape Goldenberry outperforms cranberry in almost every respect “, its antioxidant levels, vitamins A and B, C, E and K, minerals and fiber are significantly higher than those of blueberries. The cape gooseberry is an excellent source of provitamin A (3,000 I.U. of carotene per 100 g). It is also rich in vitamin C, has some of the vitamin B complex and also contains protein (0.3%) and phosphorus (55%), exceptionally high values ​​for a fruit. Therapeutic uses of the cape gooseberry The cape gooseberry has an important therapeutic use, both its leaves and the fruit, are used in the chemical and pharmaceutical industry. 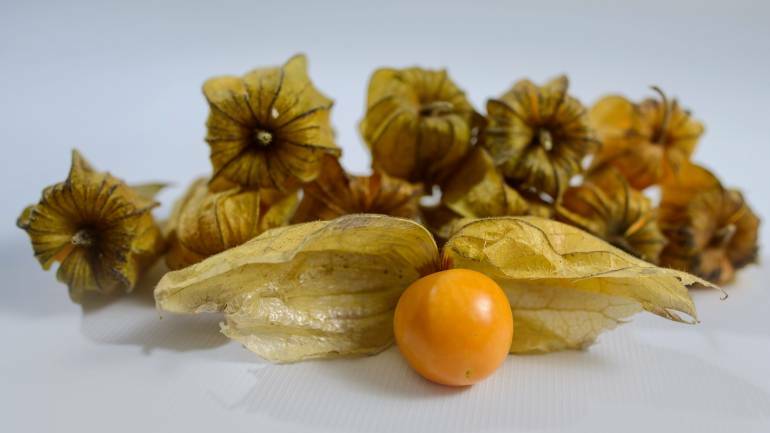 The cape gooseberry purifies the blood, tones the optic nerve and is effective in the treatment of cataracts and affections of the mouth and throat. In addition, it eliminates albumin from the kidneys and is recommended to destroy whipworms, intestinal parasites and amebas. The cape gooseberry is a calcifier of the first order. It is recommended for people with diabetes of all kinds, and thanks to its diuretic properties, it favors the treatment of people with prostate problems. It is also used as a natural tranquilizer for its flavonoid content.